Our curriculum and programs are designed to build a strong foundation in academics, as well as social, emotional, physical and moral development. This approach encourages a child’s independence, self-motivation, and decision-making skills. Our programs are carefully crafted to capitalize on the readiness of each child, and cater to individual needs, rather than a one-size-fits-all approach. Both inside and outside the classroom, children develop standards of conduct and courtesy, cooperation, self-control and a real respect for the rights and opinions of others—while developing their own individual talents, interests and abilities. The Montessori School of New York International offers half days from 9 AM – 12 PM or full days from 9 AM – 3:30 PM, and extended days from 8 AM – 6 PM. Speech: With an emphasis on expression, speech and clear diction, children gain self-confidence and soon become interested in various forms of expression, interpretation and dramatics. Grammar: Young children are deeply interested in words, and the function of words, hence we give them an early experience in grammar and syntax. To calculate is a natural tendency of man. 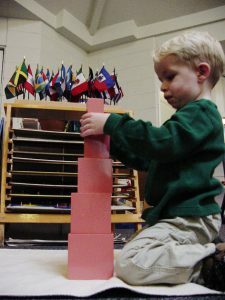 Children are introduced to numbers through their senses in a physical form, and eventually gravitate toward memorization. To respond to music is a natural and basic tendency. Our children have ample opportunity to explore music whether by creating new tunes on the bells or by interpreting it with modern dance under the guidance of specially trained music and modern dance teachers. In addition, children participate in performances at Lincoln Center, led by a Broadway professional, before parent audiences. Even the younger child experiments with air, water, electricity, etc., and reasons out the cause of each reaction himself thereby developing his intellect. Our purpose is to give the young child a clear impression of the physical environment, rather than inundate the child with scientific information that is difficult to interpret logically. A child goes home with his brain stimulated — his reasoning powers and his memory sharpened. Each child is encouraged to use his creative imagination through trial and error. From the beginning his work with Montessori sensorial materials helps refine his sense of color and other distinguishing characteristics of art. There is ample opportunity for both indoor and outdoor games in small or large groups, either in our recreation room or our spacious, well-equipped yard, or in the playground or meadow nearby. Please visit this page for information about our Summer Program.